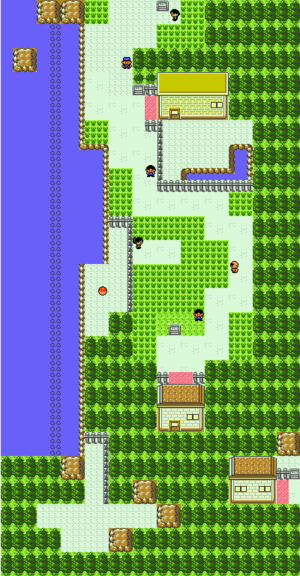 Route #34 falls between Ilex Forest and Goldenrod City. Near the top of the path is the Pokémon Daycare. Get in the water with Surf and head south to a hidden area where there is 3 girl trainers who which once beaten will give you the hold item Soft Sand. This will boost the power of Ground-type techniques. The lady with the Butterfree behind the counter will give you a free TM 12 when you complete Ilex Forest. This move makes it harder for opponents to dodge in battle (which is fairly pointless), and can be used out of battle to lure a wild Pokémon into a battle with you (but only in areas where Pokémon naturally occur). This area is full of interesting Pokémon in Crystal including Snubbull and Jigglypuff and common Pidgey. In Gold or Silver, Drowzee are the most common, and you may want to snag a pair since someone in Goldenrod City will trade you a Machop for one. In Crystal, you must trade an Abra for Machop instead. There are Abra around in the area, available day and night. But they always Teleport away immediately. That's where Gastly comes in use as its Mean Look will prevent Abra from going anywhere, unless you want to try and put Abra to sleep, which does work most of the time. Make sure to snag some Ditto, too; their ability to breed with anything makes them one of the game's most useful Pokémon. Available day and night, it can be frustrating trying to battle it as it matches the type your the current Pokémon. Switch Pokémon and it usually does not change again. The guard shortly before Goldenrod City is so concerned about crime that he attacks anything that moves at night… Even you! But if you can handle his Level 17 (!) Growlithe, you can earn a couple bucks by beating him. In Crystal, junior trainers have all sorts of useful things to say. If you give Todd your number after beating him in combat, he'll give you a call whenever the Goldenrod Department Store is having one of its rooftop sales. Gina gives you something even better when she calls back: A Leaf Stone. This nondescript building is one of the most important areas in the game. You can leave up two Pokémon in the care of the Daycare Man and Lady. If you leave a Pokémon here, it will gain one EXP for every step you take. But if you leave both a male and a female, you may return to find that they've laid an egg. Return to the Daycare a few hours after you drop off a pair to see if an egg has appeared. Keep that egg in your party, and it will hatch, like Togepi. Breeding Pokémon like this is the only way to get more of certain Pokémon (like Eevee) and to get new pre-evolved Pokémon like Pichu. If you don't have a breeding pair, a similar Pokémon may suffice, or you can use a Ditto. They won't always mate, but it's worth a try. If they're going to, it won't take long, but you can save time by looking at the Pokémon in the pen. If it says that they seem interested in each other, expect an egg. Check out the Breeding section for details. In Crystal, you'll be given an Odd Egg the first time you visit. This egg, which will hatch as normal, contains a random pre-evolved Pokémon: Pichu, Cleffa, Igglybuff, Smoochum, Elekid, Tyrogue, or Magby. 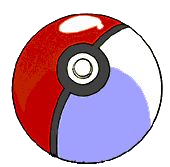 The real advantage to a Pokémon from this egg is that you have a 50% (Japanese version) and 14% (US version) chance of it being a Shiny, and they all know the move Dizzy Punch, which can confuse your opponents! Don't miss this opportunity to get a great Pokémon early! Togepi has a lot of fun attacks, like random move-unleashing Metronome (at level 7) and Encore, which forces your opponent to repeat its last attack 2-6 times (at level 25). It's too bad that Togepi's Attack and Speed scores are so low, as you'll need to use it constantly to make it tame enough to evolve into a Togetic. Togepi can learn Headbutt, however, which is a strong Normal type and if you make sure that Togepi doesn't die every time he goes out to battle, he will evolve into a Togetic by around level 25. Has Professor Elm's Egg hatched yet? The egg Professor Elm gave you hatches based on the number of steps taken. If you've made it this far, it probably already has. If not, check the egg's stats: The message there will give you an indication of how far along it is. When it does, congratulations—you have a Togepi Later, bring the Togepi to Professor Elm in his lab to get an Everstone. After you have learned surf, go to the water in the left side of the route. First surf down to the area behind the fence, there is a nugget and a piece of rare candy hidden in the top of the tree closest to the nugget. If you surf further down, you'll come across these three elite trainers. There's no pause to heal between the first two fights, so come prepared: Good Electric Pokémon like Chinchou and Grass Pokémon like Sunflora are a must here. After you have defeated them all, talk to the oldest sister (in the bottom) and you will receive the Soft Sand that powers up Ground-type attacks. Keith will only battle you at night. Abra can't do anything but Teleport, until it evolves into Kadabra at level 16, unless you give it a TM. It then learns Confusion, Psybeam at level 21, and Psychic at level 38. This family has terrible Defense, but hardly needs it: they're so fast and have such high Special Attack that they can frequently win on the first turn and can learn reflect which improve resistance to physical attacks. Too slow to compete with other Psychics like Mewtwo and Alakazam, Drowzee and Hypno were often overlooked in Red/Blue/Yellow. Drowzee and evolved form Hypno have a few new late game attacks in Gold/Silver/Crystal, but are still just too slow. In battle, Ditto is still a one-trick pony that can copy any opponent's moves, but not their stats (its stats are very low). But outside of battle, Ditto is capable of mating with just about any Pokémon, including those that seem like they don't have genders. So, keep Ditto out of the team, but catch him for breeding. Outside of one new Defensive technique (Protect, which only works well when combined with other moves that Krabby can't learn), this is the same old Krabby. Its strengths are good water attacks and the ability to learn four HMs: Cut, Surf, Strength, and Whirlpool. It has incredible attack power. Some of its good moves are Guillotine at level 27 and Krabby's unique Water-type move Crabhammer at level 41. Jigglypuff is improved in Silver and Gold, it can learn the Defense Curl and Rollout combo by leveling. Its starting move Sing can be teamed up with TM42 Dream Eater for some Special damage. It learns Double-Edge as its last move. It has high HP at the expense of weak stats but gets extra damage on Double-Edge for being a normal type. Another strength of Double-Edge because the 1/4 damage Jigglypuff gets hit back with is usually trivial because of its high HP. Like Pikachu, it can now lay an egg containing a new Pokémon, Igglybuff, that is even more obnoxiously cute. This page was last edited on 20 November 2018, at 03:17. This page has been accessed 504,280 times.